This Nativity set contains 9 figures: Joseph, Mary with baby Jesus in her arms, three wise men, two camels, and a palm tree. 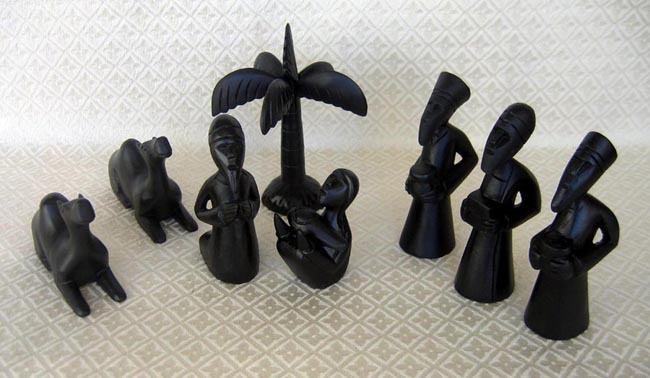 The soft wood (fir or pine) figures have been painted black. The height of the palm tree is 6.5 inches. Pekerti, a social development agency formed in 1975, is located in Jakarta. The foundation works to supplement the incomes of subsistence farmers and rural people through the development and sale of traditional crafts. Pekerti provides training in domestic marketing and service in export marketing. For this purpose, Pekerti established a nonprofit trading company, PT Pekerti Nusantara. PT Pekerti Nusantara is closely linked with all Indonesian ATOs and helps disadvantaged rural artisans to upgrade their production, business and marketing skills. To accomplish its goals, PT Pekerti Nusantara stresses quality control, training and working together cooperatively. In addition Pekerti assists artisans by offering loans, school scholarships, help with medical expenses and emergency aid in disasters. Currently, Pekerti works with more than 1,000 artisans throughout Indonesia.